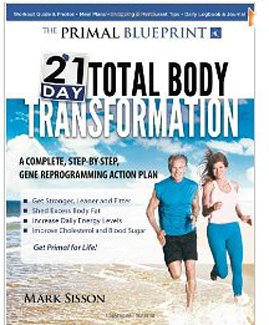 The Primal Blueprint 21 Day Body Transformation is the newest best-selling book by fitness author Mark Sisson. It provides an in-depth look at his principles for eating your way to an athletic, ripped body, and the workouts used to hone it. I have one recommendation, buy it! The Primal Blueprint 21-Day Body Transformation is 192 pages of no-fluff fat-burning information that focuses on the strategies needed to reprogram your genes to slow down aging and get rid of excess belly fat. His program is much more than another low-carb, Paleo diet plan. Getting rid of male belly fat has just gotten easier. Although he's a Malibu, California surfer, Mark Sisson is a hero way down here on the Florida Gulf Beaches. His credentials as an athlete and author, principles for eating and fitness, and laid-back attitude resonate strongly here in Paradise. Mark Sisson definitely over-delivers when it comes to getting you the critical information needed to get the cut, muscular, defined body you have always wanted. * Get stronger, leaner, fitter. * Shed excess body fat. * Increase daily energy levels. * Improve cholesterol and blood sugar. Inside, you will find the Eight Key Concepts that create the foundation to transition into what Mark calls, the "Primal Lifestyle." The Primal Blueprint 21-Day Body Transformation is focused on optimal nutrition, with the majority of your food choices coming from natural foods...those produced by Mother Nature. Mark's protocol is not a diet, it is a complete guide for restructuring your lifelong eating habits. In order to get a body that looks incredible on the beach, you definitely must get sugar foods and high-carb/high-calorie processed foods COMPLETELY out of your diet...starting now! Yes, those foods taste delicious because of the amount of chemicals injected into them, but have they given you the tight, muscular body you want? Hell no, they haven't...so why continue eating foods that are only good for increasing the size of your love handles and belly fat? It is going to be tough to give up grains and foods like donuts, double-cheese burgers, pizza, and pasta with creamy sauces...and replace them with fresh vegetables, raw fruits, and solid protein sources like turkey meat, wild fish, and grilled chicken breasts. However, do you want to stuff great-tasting chemicals into your system, or do you want a more muscular and defined body? Is the choice really that difficult when you think about taking off your shirt in front of a group of women on the beach? One look at Mark Sisson and you know he practices what he preaches at 57 years old (2011) he is ripped like a college defensive back. His blog, Mark's Daily Apple chronicles all of his eating and workout experiences. * Go on family hikes on the weekend. * Exercise in the aerobic zone of 55% - 75% of your maximal heart rate. * Mark has four functional strength movements. They revolve around push-ups, pull-ups, squats, and planks. * Strength training is the name of the game. These workout sessions are short and intense. Some last 30+ minutes, while others are abbreviated to 15 minutes. * In the Primal Blueprint 21 Day Body Transformation you will be introduced to "sprint sessions" and learn how they stimulate testosterone production and human growth hormone to make you more lean and defined. If you are truly interested in the cutting-edge strategies to get a beach body that will make women pause, buy this book. The Primal Blueprint 21 Day Body Transformation is the real deal.